Despite encouraging results indicate that nanovectors are reliable tools to treat a considerable number of pathologies, their use in disorders of central nervous system (CNS) is hampered by some limitations. A major challenge for their usage in CNS is their limited ability to cross the blood brain barrier (BBB), which often prevents to attain effective pharmacokinetic levels of therapeutics in the brain. Recent advances led to the generation of improved nanoparticles showing increased CNS penetration , therefore opening new avenues in basic and clinical neuroscience . Among such particles, metallic nanoparticles are extremely attractive tools for their biophysical characteristics . Gold nanoparticles (AuNPs) display unique optical and electronic properties to be considered reliable tools for drug/gene delivery, biomedical imaging , photothermal and microwave therapies . AuNPs can be easily and uniformly functionalized with different chemical groups, allowing these particles to target specific locations in different organs as well as to reduce toxicity [9, 10]. 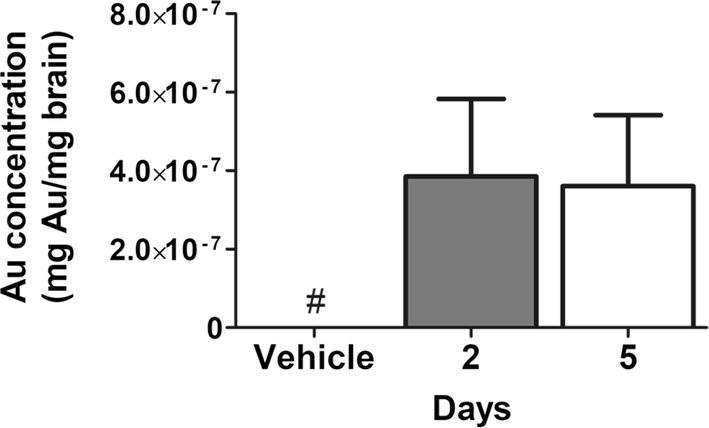 AuNPs display size-dependent kinetics and distribution when injected in tissues [11, 12]. The intravenous injection of AuNPs results in accumulation of particles in several organs, including the brain. Interestingly, particles with sizes in the range of 15–50 nm cross the BBB better than particles with bigger diameters [12, 13]. The surface functionalization has a great impact on pharmacokinetic properties of AuNPs . For example, transferrin-coated nanoparticles enter the brain through transcytosis and are more BBB-penetrant than other types of functionalized AuNPs . Polyethylene glycol (PEG) coating of AuNPs increases their solubility and reduces toxicity . Indeed, in a model of spinal cord contusion the local injection of PEG-coated AuNPs improved functional recovery and attenuated demyelination . Insulin coated AuNPs crossed the BBB, reaching the brain with concentrations that are around 5% of the total injected dose . However, 2 days after the delivery, the concentration of particles in the brain drops to values around 1–2% of the injected dose . Imaging studies further corroborate these observations, showing that once AuNPs get into the brain, they rapidly disappear [17–21]. Intra-carotid injection of AuNPs increases the penetrance of particles in the brain, although their diffusion in the parenchyma is limited to few microns from the visible vessels . Repeated treatments can increase the penetrating amount of AuNPs in the brain [6, 17, 23], although an uncontrolled accumulation of AuNPs in neurons could create some adverse effects, such as alterations of the firing properties of neurons . Therefore, we must take in consideration such aspect if we plan therapeutic strategies for chronic diseases/applications. The use of intra-parenchymal injections or the implantation of catheters, both by-passing the BBB, have the great limit of requiring invasive surgical procedures. Likely, both approaches can trigger undesired local inflammatory responses [25, 26]. A strategy to increase the penetrance and the permanence of appropriate concentrations of AuNPs in the CNS, that avoids the use of serial injections, requires alternative routes of administrations. In a model of focal lesion, such as the spinal cord injury, PEG-AuNPs injected in two sites that flanked the lesion epicenter efficiently supported the functional recovery of mice . In spite of this noteworthy result, we can speculate that such procedure will find some limitations in diseases featuring large or disseminated brain lesions, such as multiple sclerosis (MS). Among alternative approaches to delivery AuNPs, the intrathecal route offers several advantages and it has been used to delivery drugs, as well as to infuse the brain with anesthetics, trophic factors and antibodies, although it has never been used to deliver nanoparticles [27, 28]. Experiments of gene delivery in mice clearly demonstrated that the intra cisterna magna (ICM) route is safe [29–31]. Indeed, gene therapy experiments showed that ICM injection of lentivirus leads viruses to diffuse consistently in all cerebrospinal fluid (CSF) spaces, infecting both choroidal and ependymal cells . A considerable number of putative drugs lacks the ability to penetrate the BBB, and for this limitation none of them were further pursued as therapeutics. The functionalization of nanovectors with these molecules could, in principle, overcome such limitation, allowing their diffusion in diseased brains. Thus, the physiological barrier represented by the BBB could be crossed by nanoparticle-supported drugs able then to interact with their targets. However, after an initial enthusiasm for this approach, it became clear that the general efficiency of nanovectors to cross the BBB was modest [17–21]. In this context, AuNPs have attracted attention for their safety and biophysical characteristics . 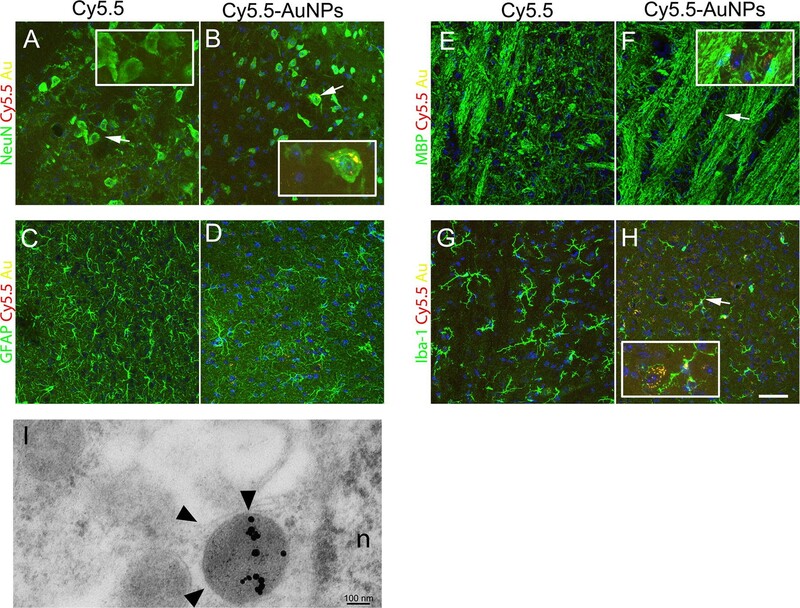 The direct injection of AuNPs in the CNS parenchyma is attractive, although our data indicate that such procedure may generate tissue damage and microglia activation. Intranasal administration of AuNPs, conversely, leads to their uptake in different brain regions and is a promising method for the BBB passage of nanoparticles, although the regional distribution in the brain of molecules may vary from substance to substance, and additional studies are needed to validate this approach . Repeated intravenous injections of nanoparticles, often using high dosages to achieve BBB permeation, could induce their accumulation in the liver causing inflammation and apoptosis and may alter neuronal functions [41, 44]. A recent study, showing in vivo instability of coated AuNPs, adds a further layer of complexity, suggesting that using AuNPs to deliver molecules as well as their tracking in living animals may be influenced by a certain degree of molecular instability and/or cell metabolism . Indeed, fluorochrome-coated AuNPs are processed by lysosomes in the liver, and molecules tagging AuNPs can be cleaved by proteolysis . These experimental observations should be considered in the interpretation of distribution studies after systemic administration of AuNPs. Immunofluorescence and electron microscopy have been done according the following methods [49–51]. Brains were sagittal or coronal sectioned (20 µm) and one section every 250 µm was used for immunofluorescence. Slides were washed in PBS 1× and incubated with the following blocking buffer: PBS 1×, BSA 1 mg/ml, FBS 10%, Triton 0.1% (Sigma). Primary antibodies were diluted in the same buffer and incubated on section for 12 h at + 4 °C. Secondary antibodies (Alexa-flour conjugated) were incubated according to manufacturer’ instructions, then sections were cover slipped with Dako mounting mix. The following antibodies were used: mouse α-NeuN (Millipore, 1:800); rabbit α-MBP (Millipore) 1: 500; rabbit α-Iba1 (Wako) 1:400; rabbit α-GFAP (Dako) 1:1000. Secondary, Alexafluor 488-conjugated antibodies were used according to manufactures’ instructions. Acquisitions were performed with a Leica SP8 confocal microscopy equipped with a 40× objective and with super-sensitive HyD detectors. Fluorescence was recorded as square 8-bit images (1024 × 1024 pixels) and stored as separate image stacks for each channel. Alignment of images to obtain largest field of view of coronal sections was done by automatic stitching of stack images using the Leica (Las-X, Leica). Acquisition of fluorescence from Au was done according published methods . We used an excitation wavelength of 532 nm, while signals were acquired in the 594–640 nm window. Images showed the maximal projections of Z-stacks acquired with a 0.8 µm step or cross sections of selected cells acquired with 0.3 µm step. Images were pseudo-colored using Las-X software. For EM analysis, brains were post-fixed in 0.12 M phosphate buffer supplemented with 2% glutaraldehyde, and further sectioned to get a region encompassing the 4th ventricle and the cerebellum. These parts were further post-fixed with osmium tetroxide and embedded in Epon (Fluka, Buchs, Switzerland). Ultrathin sectioning of the CNS allowed the generation of 70 nm sections that were imaged by a transmission electron microscope (LEO 912AB). In vitro quantification of Cy5.5-AuNPs fluorescence were performed using the FLI (FLI) acquired with IVIS SpectrumCT System scanner (Perkin Elmer). 12951_2019_481_MOESM1_ESM.tif Additional file 1: Figure S1. Synthetic route for Cy5.5-AuNPs. General scheme for the synthesis of surface-engineered Cy5.5-AuNPs. PEG-AuNPs are synthesized using sodium citrate as reducing agent and preliminary capping ligand. Purified PEG-AuNPs have been functionalized by forming a stable amide bond between PEG-NH2 and NHS activated chromophore Cy5.5. 12951_2019_481_MOESM2_ESM.tif Additional file 2: Figure S2. Cy5.5-AuNPs in tail vein-injected mice. Panels A shows the FLI analysis of mice receiving a single injection of Cy5.5-AuNps in the tail vein that were sacrificed 5 days after the injection. Epifluorescence scale is plotted on the left side of the panel A. A representative confocal scan of the cerebral cortex showing NeuN and Cy5.5 in mice injected with the vehicle and in mice injected with Cy5.5-AuNPs are shown in panels B and C, respectively (n = 3 for each group). Scale bar 100 µm. 12951_2019_481_MOESM3_ESM.tif Additional file 3: Figure S3. Cy5.5-AuNPs in intra parenchymal injected mice. Panel A shows FLI analysis in brains receiving a single intra parenchymal injection of Cy5.5-AuNPs. Epi-fluorescence scale is plotted on the right side of the panel. Arrow in panel A indicates one of these brains that was subsequently sectioned in coronal slabs and further assayed for FLI FLI analysis (B). Epi fluorescence scale is plotted on the right side of the panel. Panels C and D show confocal scans of the cerebral cortex from a Cy5.5-AuNPs-injected mouse labelled for Iba1, Cy5.5 and Au. Iba1+ cells were scored in both the contralateral (C) and the ipsilateral cerebral cortex (D). Percentages (± S.D.) of Iba1+ cells are shown in the histogram of panel E (n = 3). Arrow in panel D indicates a single Iba1+ cell that is shown at high magnification in the confocal cross section of panel F. Scale bar 100 µm. * p < 0.05 unpaired t test. 12951_2019_481_MOESM4_ESM.tif Additional file 4: Figure S4. 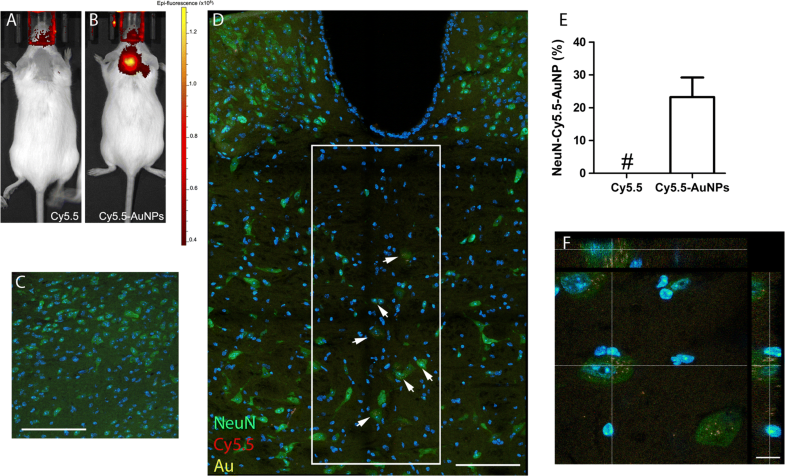 Co-localization of Au, Cy5.5 and NeuN in cortical neurons. Coronal sections from mice receiving a single intra-parenchymal injection of Cy5.5-AuNPs were labelled for NeuN (C) and submitted to confocal imaging for Au (A) and Cy5.5 (B). To maximize the probability to find triple positive cells we did the imaging in the cortical wall in a region that was adjacent the site of injection. Merge panel in D show co-localization of Cy5.5 and Au in NeuN+ cells (n = 3). Scale bar 30 µm.